Two years ago, I began transitioning from video games to table games. But I always thought that one day, I'd come back. I kept one eye on my cards, the other on the door, which was actually very impractical but did give me a spooky Forest Whitaker look that would unsettle my opponents. Not any more, though. As of this week, I'm losing it. If I were an undercover cop in a movie, this'd be the part with a long shot of me in a crappy bathroom, staring at my reflection, wondering who I am. It's all to do with physicality, the status of these things as actual objects. I'm not sure I can live without it anymore. Two months, ago, the morning after. Filip from Czech Games Edition, my closest contact inside the board game underworld, sat in my breadcrumbed kitchen, assembling a copy of Tzolk'in: The Mayan Calender with quick, clicking motions. This is what amounts to a mid-level business meeting in the board gaming world. I've been on the other side of the fence, in video games, with the $16 cocktails, the hotels that look like offices, the offices that look like hotels. But I like the earth of this better. I set down a couple of anemic cups of English tea as Filip reached into the box and offered me a handful of tiny, glassy pieces. They were skulls. A little mass grave in the palm of my hand. When I started getting involved in board games, I picked up on the obvious quickly. The game as physical object is a pleasing thing. Working with your friends to set up a game brings a happy psychological bookending, like opening a brand new book. “Pirating” a bluffing game like Skull & Roses out of some coasters at your bar and a sharpie is cool. After that, I started learning a little science. Humans prefer handling wooden components to plastic. Heavier is better, and size is to be handled in extremes. Big playing pieces are great, but so are tiny ones. Even individual games can teach you a lot. Dixit's oversized cards stealthily make you feel like a child again. The rotating the gears of the aforementioned Tzolk'in lay down the tactile equivalent of ASMR. Mage Wars, which my site covered here, has an actual, physical spellbook. These things have to be touched to be believed. What I didn't imagine, though, is what came next. It turns out that beyond the pleasantly tactile lies something still more seductive. It's the capacity for analog games to hook you on an emotional level, as totems of fun. This is what's stopped me answering the calls of the video game precinct chief (what might he look like?). Take my Netrunner decks. They represent my first experience getting into a collectible card game, and it didn't take long for these things to begin a kind of emotional osmosis. Technically, Netrunner is a “Living Card Game”, meaning Fantasy Flight's new model of not releasing random booster packs but set, monthly expansions. That's a fitting moniker, because my decks are alive. They're not just picking up scuffs and whatever microscopic flecks of me whenever I touch them. They're absorbing every one of my failures and victories, and all of the time I spend with them. Two weeks ago, I went to see my friend Si (pictured) and we played Netrunner for an entire night while drinking bourbon. When our nerves were shot through, we talked about Netrunner. Then I crashed on his floor and we both dreamed about Netrunner. You wake up in the morning after something like that, and you see your decks where you left them on the table, and you know they've changed. And it gets worse. When you want to alter your deck, and you lay all those cards face-up, categorised by Ice Breakers, Hardware, Agendas, it's like being stood at an operating table. You wince as you remove old friends, slipping in cards that may or may not work. The housemate you roped into supporting you sponges sweat from your brow. Finally, you're finished, and you shuffle that thing and pick it up, and it's the same deck as before, but not. It's fascinating. You're scared to play with it. "My decks are alive. They're not just picking up scuffs and whatever microscopic flecks of me whenever I touch them. They're absorbing every one of my failures and victories, and all of the time I spend with them." It was the week after that, though, that I knew I was truly lost. I sat cross-legged on my bed in the small hours the night, opening up a shipment from Victory Point Games. A tiny Californian company. The thing had an impossibly proud, red box with a “Made in America!” sigil on the back. I picked up one of the punchboards of tiles and found two strange things about it. One, the tokens just fell out, made of the thickest, nicest cardstock I've ever felt. Two, the punchboard was coated in filth. I stared disbelievingly at my blackened fingers. A cursed game in a witching hour. PLEASE USE THIS TO REMOVE ANY EXCESS COAL DUST FROM THE COMPONENTS." And just like that, I fell in love with Victory Point Games. That this mom'n'pop company found a great solution for their tokens, but it left them dusty. But they trusted their customers to appreciate the tokens, the thoughtfulness, and take part in the assembling of the game themselves with a literal bit of polish. In time, when I'm killed in an accidental shootout with the video game police, my love interest will be cradling my corpse and she'll find that napkin in my pocket. And she'll understand. I get it now. The appeal of table games' physical presence isn't to do with the luxury of the objects themselves. Play is how we form emotional connections. The purpose of the game-as-object is to make it easiest to foster those connections, allowing everybody to invest in what's on the table, right down to building it up and breaking it down, and in doing so, it gives you the path of least resistance to connect to each other. Put another way, that tiny plastic man isn't a toy. He's an emotional power adaptor. My game nights are powerful things now, and they're getting stronger. And stranger. Last weekend I got six people together to play the epic WW2 swear-a-thon that is Memoir '44: Overlord, but my friend also brought two backpacks of his girlfriend's military equipment. We played wearing wobbly helmets and camo trousers of impossible size. Why? Because it was funny, mostly, but also because when you augment a game's components to such a ridiculous extent, you can't help but share something, and remember that game for the rest of your lives. And as a gamer, I'm not sure there's anything quite that priceless. We've got bigger plans, too. We want to organise an epic-scale game of Werewolf, at night, next to a giant bonfire. Do you see? Your surroundings are the components. The people are the components. I've spent my entire life playing video games without once feeling like I was closer to something. Here, I feel like I'm getting better at play. Don't look for me. I'm pocketing my napkin and running for as long as I can. 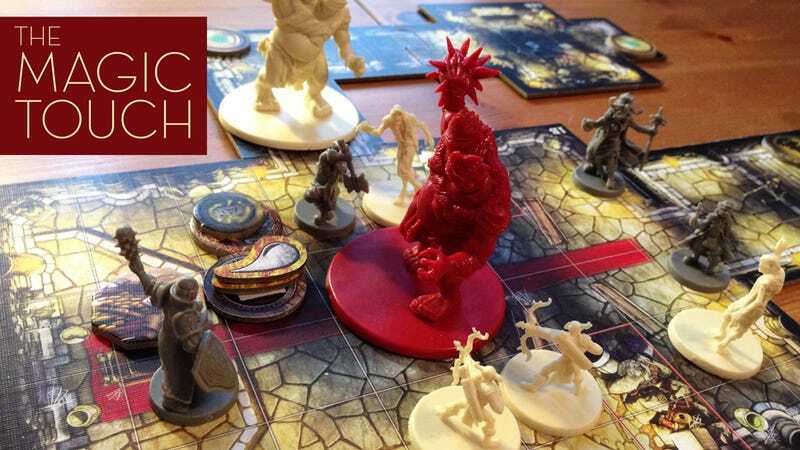 Quintin Smith is a games columnist able to identify different board game manufacturers by their scent. He runs Shut Up & Sit Down, a board game site, and is @quinns108 on Twitter.